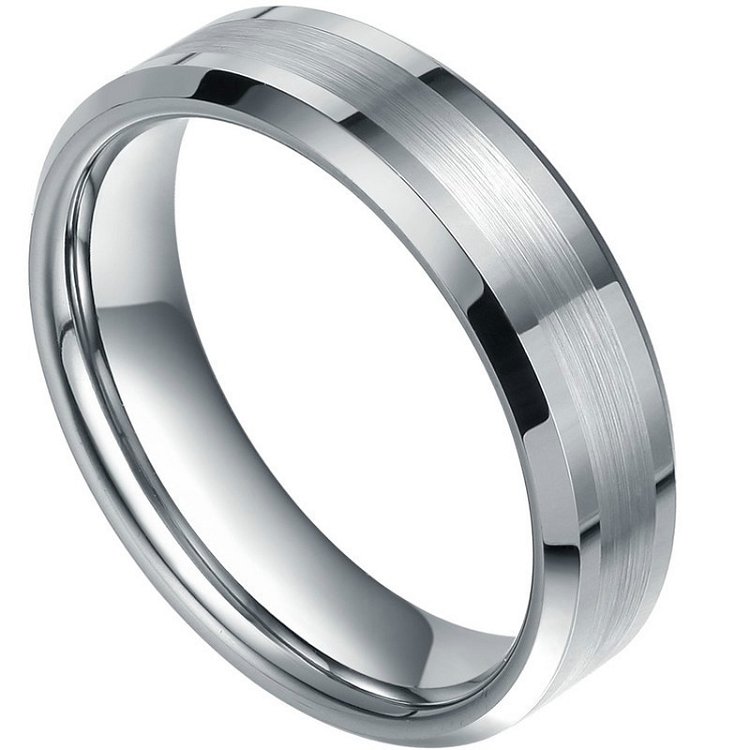 Adding to the very popular Beveled Tungsten Rings, we now offer you another option. 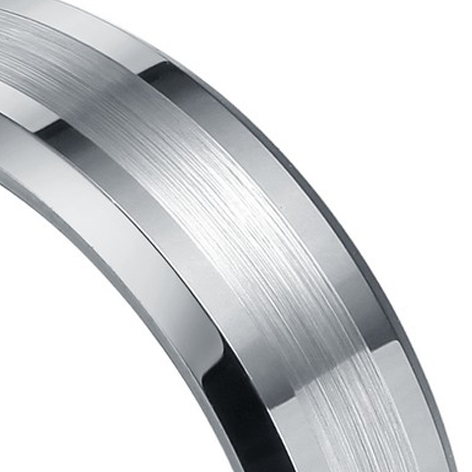 The Dynamis 7mm beveled tungsten ring has polished sides and is polished on the outer top of the ring. The center of the ring is brushed for a very unique and clean look. Although it does not show on this photo, this ring comes with the 'Tungsten Carbide' stamp on the inside of the ring. This ring is completely hypoallergenic and is comfort fit. 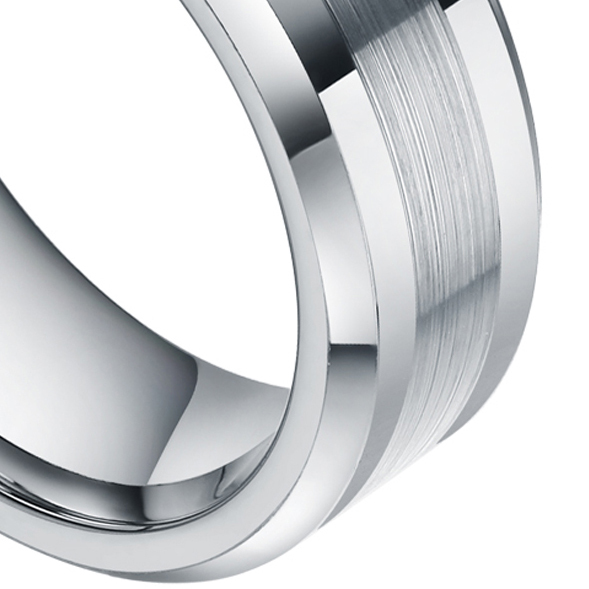 We guarantee that this tungsten ring will never bend, tarnish or scratch. If it does, we will replace it. If you need a durable, yet clean tungsten ring, you found it! This ring also comes with a black velvet ring box and as always, Free Shipping! Q: If i engrave it, how will i return the ring if it is the wrong size? You are not able to return a ring that has been engraved. If you are not sure on the size, we will send you the ring, not engraved, with a pre-paid envelope. If the ring fits ok, just put it back in the mail and we will have it engraved for you. If it does not fit perfect, let us know so we can adjust the size. I hope this helps! If you have any other questions, please let us know! Q: I see a line going across the ring, what is that? A: That is just a reflection. The ring is the same going all away around the ring, there are no lines going horizontal. Q: Is this in white or gray tungsten? Q: Do you sell any 8.75 size runs or only half sizes? Q: Can this ring be made into a 4mm or 5mm ring? Q: Can this ring be made in an 8mm width? If so, will the price be the same? We ordered two rings for our upcoming wedding and couldn't be happier. Not only were they extremely helpful with answering questions on the phone, but rings arrived exactly when promised and look absolutely amazing. bought size 7 which was larger than expected. They exchanged it for a smaller one free of charge. The product is just awesome. Very nice ring! Great service and fast delivery. I will be shopping here again. Great ring very satisfied. Fast delivery, had ordered wrong size sent them an email on what size should be they updated my order right away and had it delivered to me in no time with the correct size. I must second all the great reviews. Two rings ordered in anticipation of upcoming nuptials. Arrived in good order. An incorrect measure at a local big box store made one ring too small. I resized according to the directions by Tungsten Fashions. Exchange was easy and quick and there was always a live voice to answer the phone when I called. A sincere thank you to everyone at Tungsten Fashion for allowing our plans to move forward without any hassle or worry. You are the greatest. Nice Quality, fast shipping and incredible price. Can't ask for more than that, thank you. Very speedy shipping and exactly as described. A really, nice ring. Great service, great quality. Nice ring but the ring was a little too big for me both in size and in width. I exchanged it for a smaller size Nicolle Beveled Ring 4mm and was extremely pleased with the service and the ring. It was the easiest online exchange I've ever done. Thanks!!! Very pleased with the ring! My husband loves it! I am extremely pleased with the quality of this ring and for the price there us no better deal you can find. The ring is stunning and anyone can afford this high quality ring. Thank you for providing this superb ring to the everyday consumer. I had a white gold wedding band that just didn't feel right. I decided to replace it with Tungsten. Good call on my part. This ring feels SO much more comfortable! If I could rate it at more than 5 stars, I sincerely would! To top it all off, I saw my ring at a "National Chain" and was shocked to see the price. It was over $300.00! That's right... For the EXACT same ring! The ring looks great, is easy to clean and take care of, and nothing scratches it. The ring shipped fast and my wife loves the way it looks. I will be wearing this ring for years to come. I bought this for my husband who was completely happy with the ring he had. I wanted his hand to look like his wife cared enough. This ring is Gorgeous. Y'all got it sent out in a short amount of time, even with the holidays. Thank you so much for such a beautiful gift. I order this ring for my husband who is a home remodeler. He never wore his wedding ring (before he lost it) at work so it wouldn't get scratched....he wears this ring every day and it still looks brand new. He loves it, it is comfortable and looks great. Customer service is 2nd to none. I have ordered other rings from Tungsten Fashions and all contact with them has been great and I received the rings faster then expected. Thank you! Did a lot of research and decided on this ring for my husband. He likes it and it looks like it will wear well! I ordered the Dynamis Beveled Tungsten Ring 7mm and I am very satisfied. The ring is very durable, hasn't scratched, and fits well. I am extremely happy with my purchase. The quality and look of this ring is incredible! I will recommend to anyone!